Though it does not pay the household bills, I easily meet the dictionary definition of a journalist. Beginning in 2001, I began to freelance for New England newspapers including the Boston Globe, The Providence Journal, the New York Times, other newspapers, and magazines. In 2002, this led to a still-continuing contract to write essays for the Hartford Courant, the state’s main metropolitan daily and the nation’s oldest continuously published newspaper (1764). By 2004 I was writing a weekly opinion column, which dropped to bi-weekly in 2008. Apparently, I’m the first scientist to join the Courant’s stable of columnists. While at the Courant, I’ve shared journalism prizes, spoken at their conferences, advised several editors, given public lectures, and worked with journalism students. 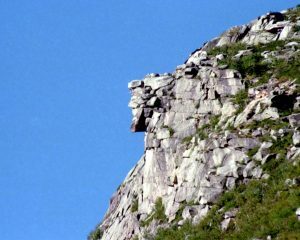 Photo: New Hampshire’s state symbol, the Old Man in the Mountain, in Franconia, New Hampshire, now deceased. One of my early columns (Hartford Courant, July 2, 2004) grieved the loss of the icon but celebrated the surrender: "Sign or no sign, God didn’t go out of business in Franconia Notch….Now, tourists can focus more clearly on the beauty of the weather-tarnished crags, cliffs and spires, where glaciers and gravity have carved the real face of nature, one that need not contain our graven image." Photo is unsourced from the web.